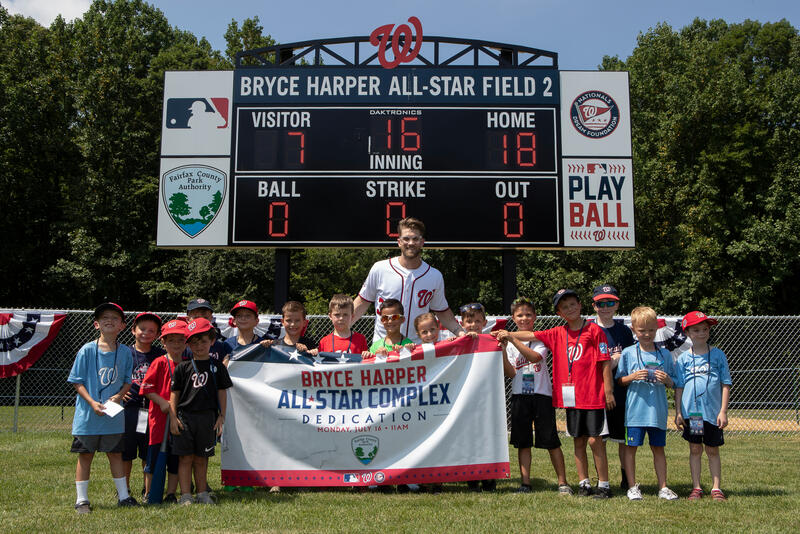 While the 2018 MLB All-Star Festivities were filled with incredible moments and exciting highlights from plenty of the league’s biggest stars, it was Little Leaguers® past and present that shined in the spotlight during this year’s Mid-Summer Classic. From current Little Leaguers competing in events such as the MLB Challenger Game, the Junior Home Run Derby, and the Pitch, Hit, and Run National Finals, to a number of Little League® graduates showing off their skills at the Futures Game, Home Run Derby, and the MLB All-Star game, Little Leaguers of all ages had a chance to shine in the spotlight this July in Washington, D.C. 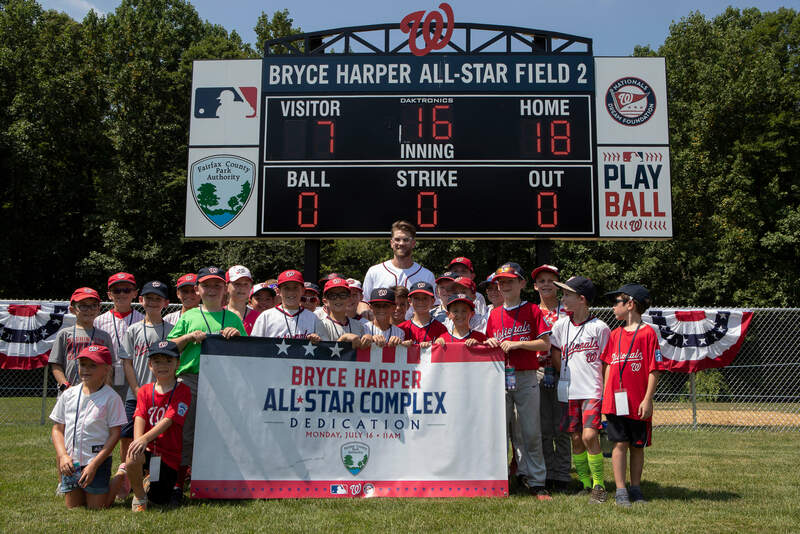 The excitement wasn’t limited to inside the foul lines, however, as a local Little League Program received the surprise of a lifetime as Washington Nationals superstar Bryce Harper made a special presentation with a newly renovated field dedication. 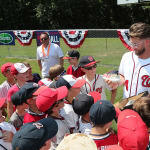 Here is a brief recap of the exciting festivities highlighting Little Leaguers past and present that occurred between July 13-17, 2018 in Washington, D.C.
Friday, July 13 – Little League Challenger Division® Teams Compete in Washington, D.C. 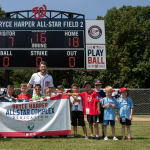 Kicking off the All-Star Festivities on Friday, July 13, was an exciting day for the Little League Challenger Division® as members of the Challenger programs from Arlington (Va.) Little League and Northwest Little League (Washington, D.C.) were invited to participate in a game inside Play Ball Park. During the All-Star Armed Services Home Run Challenge, U.S. Army Staff Sergeant Jacob Hensal, a Little League father from Fort Belvoir (Va.) Little League, competed for the title. 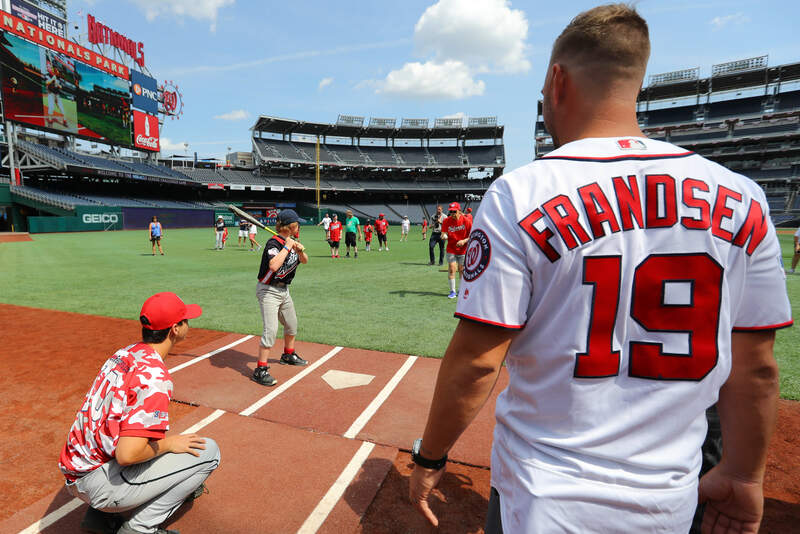 After three rounds of competition to earn a spot in the National Finals in Washington, D.C., a pair of current Little Leaguers had a chance to compete in the 2018 Junior Home Run Derby inside Nationals Park on Saturday, July 14. Stepping to the plate in the 12-Under competition was Edwin Rowe (Canaryville (Ill.) Little League) while Jorge Febres (Four Peaks Little League – Mesa, Ariz.) participated in the 14-Under competition. 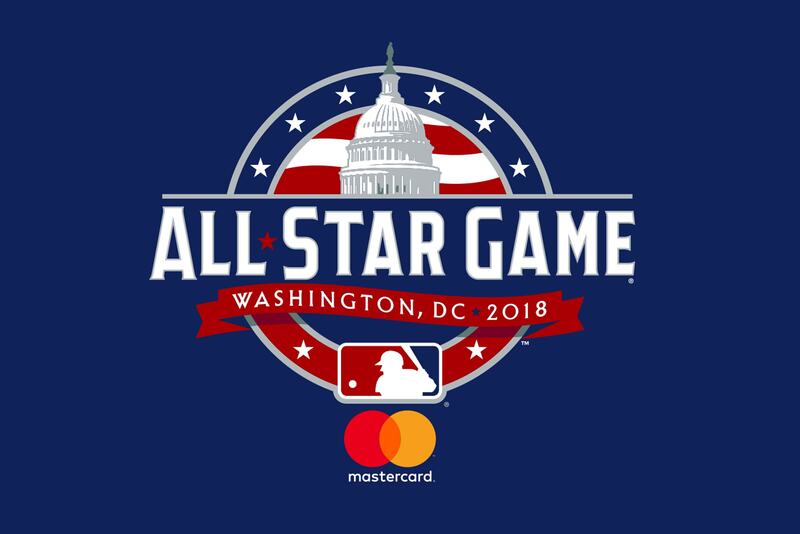 On Sunday, July 15, the future stars of the game took to the big stage for the 2018 All-Star Futures game, featuring nine former Little Leaguers taking the field. 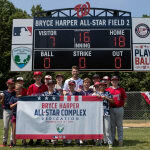 Led behind Little League Hall of Excellence Enshrinee and National Little League (Pine Bluff, Ark.) graduate, Torii Hunter, the U.S. Futures Team was able to take home the title with an exciting 10-6 victory over the World Team. The game featured a record eight combined home runs between the teams, with Little League graduates Danny Jansen (Appleton (Wis.) Kiwanis Little League) and Peter Alonso (Tampa Bay (Fla.) Little League) each adding a longball of their own. 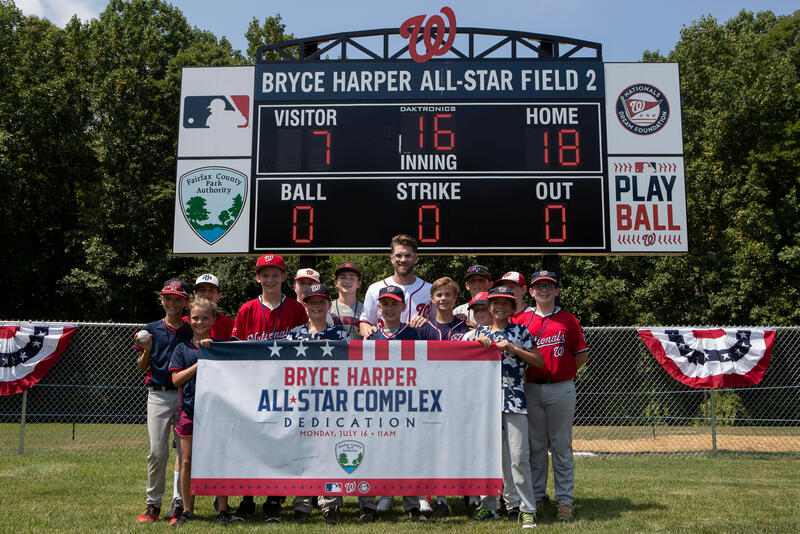 Prior to the 2018 MLB Home Run Derby, six Little Leaguers had the opportunity to compete on the national stage in the 2018 MLB Pitch, Hit, and Run Competition inside Nationals Park. Of those six competitors, three of them were able to take home the title in their respective divisions. 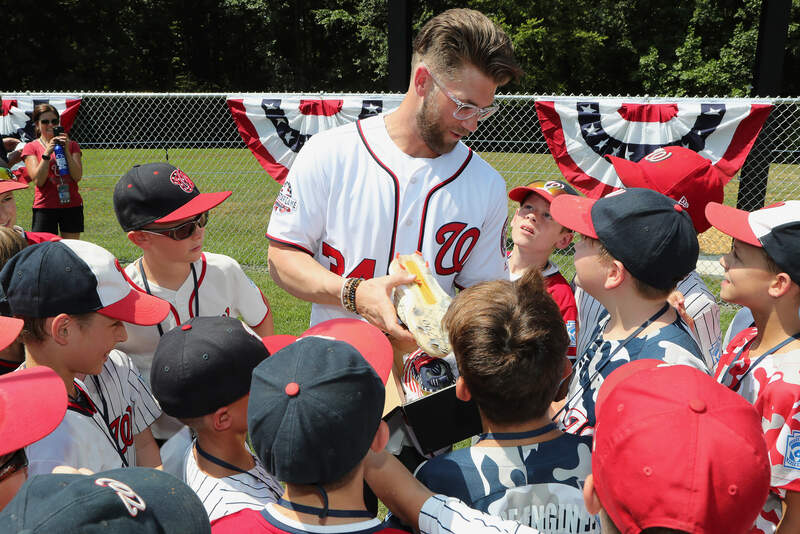 Away from all the on-field activities, Washington Nationals superstar took time out of the busy weekend to give back to some local Little Leaguers in the community. 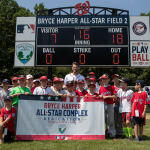 Personally dedicated to the renovation of Fred Crabtree Park, home of Reston Herndon Little League in Washington, D.C., Mr. Harper left his imprint on Monday, July 16, with the dedication of the Bryce Harper All-Star Complex, which features a pair of newly renovated fields courtesy of a generous donation from the All-Star outfielder. 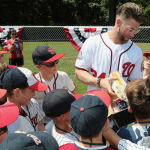 While Bryce Harper took home the official title of Home Run Derby Champion, a pair of Little League graduates in Freddie Freeman (Long Beach (Calif.) Little League) and Alex Bregman (Eastdale Little League – Albuquerque, N.M.) combined for 27 home runs in their first-round appearances at this year’s event. Featuring more than 15 Little League alumni, the 2018 MLB All-Star Game was the perfect way to end the exciting week of festivities. Last year’s Home Run Derby Champion and Linden (Calif.) Little League graduate Aaron Judge wasted no time as he put the American League on the board first with a solo home run in the second inning. Six innings later, with the game tied at 2-2 and a runner on first in the top of the eighth, Walicki Little League (New Britain, Conn.) grad George Springer was able to send a base hit to left before being driven in on a 3-run home run to give the American League a 5-2 lead. In the bottom half of the frame, it was Thousand Oaks (Calif.) Little League grad Christian Yelich was able to send an opposite-field home run to left to cut the lead to 5-3 before a two-run home run in the bottom of the ninth by Scooter Gennett sent the game to extra innings. The tie wouldn’t last long, however, as a pair of Little League grads and current Houston Astros’ teammates, Alex Bregman and George Springer, led off the 10th with back-to-back home runs to put the American League. back on top, 7-5. Despite another run given up by each team, Peru (Ill.) Little League grad J.A. Happ was able to come in and close out the game to give the American League an 8-6 victory, picking up his first career Major League save. Before the night was over, it was Mr. Bregman, a graduate of Eastdale Little League (Albuquerque, N.M.) who took the final honor as the All-Star Game MVP. 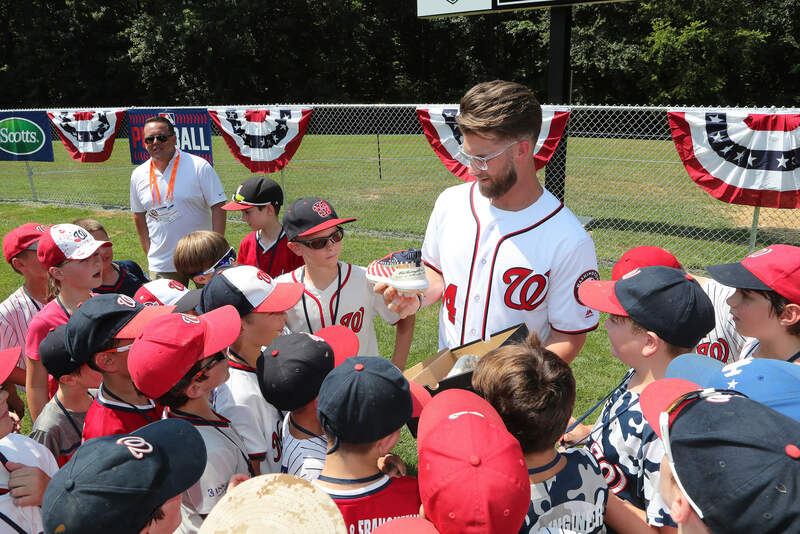 With the first half of the Major League Baseball season officially in the books, Little League Baseball and Softball is excited to see what’s in store for what’s to come, including the 2018 MLB Little League Classic, on Sunday, August 19. As we wrap up the MLB All-Star Festivities, it’s time to shift our focus towards the current Little League All-Stars as the top teams from around the world get ready to compete at the Little League Baseball World Series on August 16-26.